Michigan weddings hold a special place in my heart because Michigan has always been my home and always will be no matter how far away I move. So I was so excited when I found out that my schedule allowed me to go to Michigan to help my mom Joleen coordinate Nicole and Dante's wedding. Nicole and Dante were such a joy to be around and I knew we were going to have a good time coordinating their big day. "Dante and I meet at Saginaw Valley State University. We would often see each other at tailgating, football games, and other activities because we have so many mutual friends. Eventually I gave him my number. He texted me everyday. Crazy to look back and say I wasn't really interested in him, but he was so persistent. He never gave up and was and has always been there when I needed someone. He truly is my best friend. After a few years of dating the ultimate test came before us. I was accepted into graduate school and moving an hour and a half away from home. Both nervous for a long distance relationship, we made it work. And eventually he moved down with me and we bought our first home! In April 2016, Dante and I traveled to New Orleans with four of our close friends. The day before we went home we went to City Park. While walking around the park he stopped and got down on one knee in front of a LOVE sign that was a part of the sculpture park. After he proposed, all six of us took a Gondola ride. It was amazing! He later shared with me that he was going to propose on the gondola ride, but with all six of us, it was too packed! So while walking around the park, he wasn't sure where he was going to get down on one knee until he came across the LOVE sculpture. I will never forget that trip!" 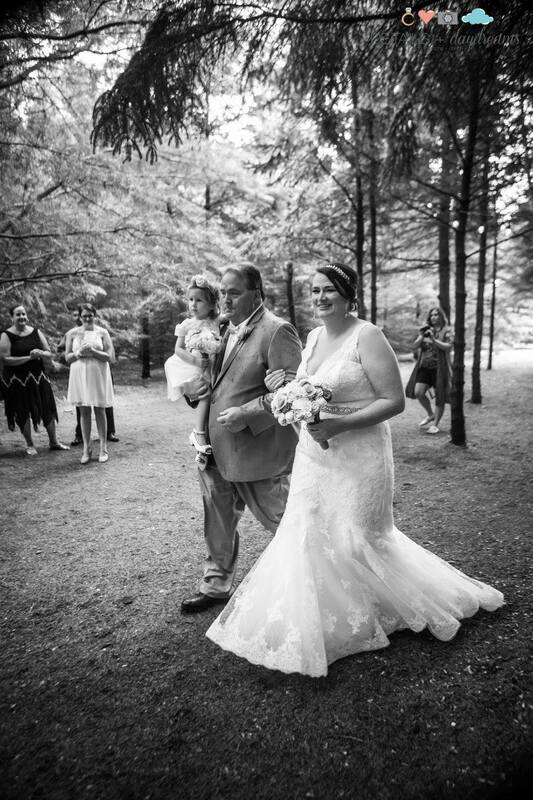 Nicole and Dante got married at the Pine Tree Barn in Flushing Michigan. The pine trees that cover the property added the perfect touch of outdoor romance to the wedding and became an important feature that no one was expecting on the wedding day. Nicole was very hands on in the whole planning process and designed and put together the entire look for her wedding day. The little details of who they are as a couple really shown through in every detail. On the day of the wedding it was gorgeous and sunny and we were setting up for an outdoor ceremony in an open field behind the barn. The pine trees lined the walkway to the field creating the perfect aisle way for a wedding. Everything was going according to plan when in try Michigan fashion, an unexpected rain storm hit a half hour before the ceremony began. Guests had already begun arriving at that point. The rain soaked all of the chairs and had everyone running for cover. After a few long minutes of hard rain the sky cleared up and the sun peaked through giving us hope. We decided to dry things off and reset for the outdoor ceremony plan again because that was how Nicole and Dante envisioned their wedding day. So I lined the bridal party up and queued the music and sent them out as planned. But right before I sent Nicole and her father out, the rain came back. So I looked at Nicole and said, "This is your call. Do you still want to walk out there in the rain?" And her and her dad looked at each other and said, "Heck yea, lets do this!" So I ran outside and had everyone gather underneath the pine trees to stay dry and sent Nicole and her dad out to meet Dante in the rain under the pine trees. Although everyone was soaked from head to toe, it was the most romantic ceremony I've ever been to. Nicole and Dante didn't let the rain interfere with there wedding celebration one bit. After everyone dried off inside after the ceremony, the rest of the night was a lively party. The night included a caricature for cocktail hour, delicious bbq for dinner, and guests dancing the night away.